A diode is a component that only conducts electricity in one direction. It is commonly used to convert from alternating current (AC) to direct current (DC). Several types of diodes exist. And it can be a bit confusing if you have never worked with diodes before. I would like to share the most standard types of diodes that are commonly used by hobbyists. Read more about what a diode is. The rectifier diode is typically used for rectifying alternating current (AC) to direct current (DC). They can usually handle big currents and voltages. Sometimes referred to as power diodes. The signal diode works the same way as the rectifier diode. But it can only handle small currents and voltages. It is faster than the rectifier diode and is sometimes referred to as a high-speed diode. 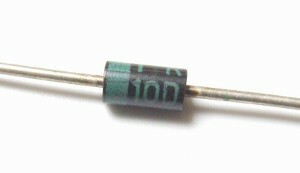 The most typical signal diode is the 1N4148. The zener diode is a component that will become very conductive (meaning that it will allow lots of current) for a certain voltage. This voltage is called the zener voltage. What this means is that the voltage drop over the zener diode will not exceed the zener voltage. The zener diode is often used as a stable voltage reference. The Schottky diode is very similar to a standard small-signal diode. The difference is that the Schottky diode has a lower voltage drop over its terminals. Normal diodes have about 0.7V voltage drop, but the Schottky has only 0.3V. It is also much faster and is therefore often used in RF circuits. A light emitting diode or LED is a diode that emits light when forward biased. It is available in several different colours, even ultra-violet and infrared. Read more about different LED types. A photodiode is a diode that conducts when it detects light. Could be used to receive the infrared signals from a remote control. If you are a beginner and wants to become one of the hobbyists, learning about the types of diodes is one thing. It is also important to learn about what and where to buy electronic components. Well, the motors are inductive loads that will produce a voltage spike when their power is turned off. The diode will eliminate this spike. And it has to be fast enough to handle the spike. can you please explain this concept in detail?